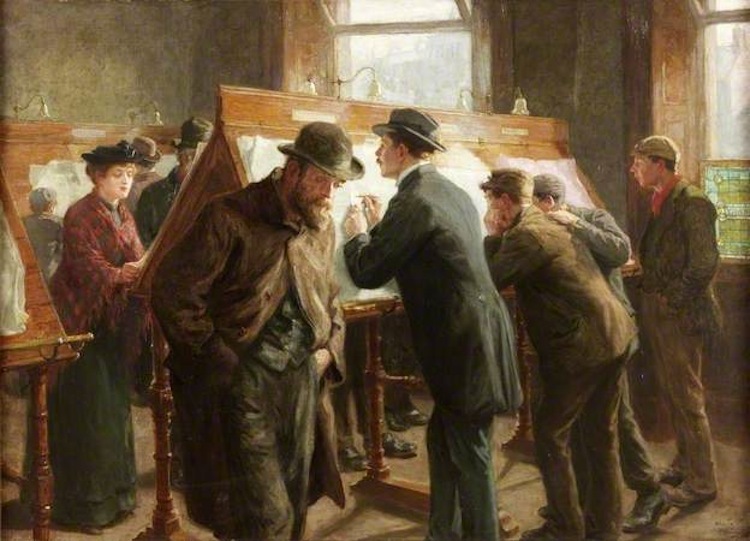 Seeking Situations, by Ralph Hedley (1848-1913), 1904. Exhibited at the Nottingham Castle Museum Silver Anniversary Exhibition, 1905 (see Ralph Hedley Archive). Courtesy of Shipley Art Gallery, Gateshead, Northumberland. Hedley often shows men at work, but this time he shows men — and a single woman, and some lads — looking for work. Most of them are combing through advertisements, probably, according to the Laing Gallery's information panel, at the Victoria City Library which was close to Hedley's studio in Newcastle. But one man appears to have given up: this is the bearded man in the foreground, slouching, hands in pockets, and looking down dispiritedly. From his clothes, especially his hat, it seems that he might have been a supervisor rather than a workman. If he had lost such a job, it might be hard for him to find another one at his age. On the other hand, the younger man behind him to the right, wearing dark office clothes, looks eagerly at the adverts. One position seems to have caught his eye, and he is jotting down the particulars. There is a touch of humour in his keen focus on the details. On the other hand, the three youths next to him, with their relaxed postures, look rather casually at the jobs on offer. These may be looking for their first jobs. One stands back, away from the lists, apparently in no hurry to start the daily grind. The woman on the other side may be unmarried, and needing to support herself by working in a shop. She looks rather too genteel for the factory work that the Laing information panel had also suggested. People in a variety of circumstances try to find their way forward in life in this light-dappled room. The windows open on an uncertain future which they face with different degrees of need, confidence and hope. This sympathetic but totally unsentimental piece of social realism is deservedly one of Hedley's best-known pictures (see, for example, Colls and Lancaster 257). — Jacqueline Banerjee. Colls, Robert, and Bill Lancaster. Newcastle-upon-Tyne: A Modern History. Chichester, West Sussex: Phillimore, 2001. Information panel at the Laing Art Gallery, when the painting was on loan there in July 2014.